The optional (31.5″W x 6″D) speaker shelf provides convenience and additional space for large-rooms. 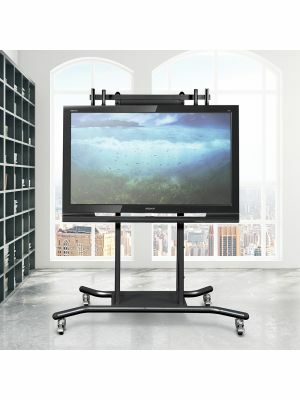 Balt presents the unique and highly durable product iTeach electric height adjustable flat panel cart. This incredible flat panel mobile cart brings up-to-date solutions to the mounting requirements. The 27675 flat panel mobile cart features state-of-the-art functions that provide ease to the users such as the height can be adjusted automatically with the help of an electric system. Users can do this by just a single button over the wired remote. The 27675 flat panel mobile cart supports displays up to 100” and can hold the weight up to 250 lbs. For users’ convenience, the 27675 flat panel mobile cart supports VESA mounting system. There are four casters for movement purposes, so users can easily move flat panel display into the desired place. The iTeach flat panel mobile cart comes with several optional accessories that provide further safety and space for compatible accessories or items. Q. Does Balt iTeach flat panel mobile cart come with warranty? Q. 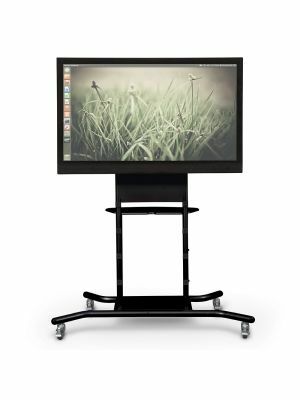 Does the Balt iTeach flat panel mobile cart hold displays more than its weighing capacity? A. Yes, the Balt iTeach flat panel mobile cart can hold displays more than its capacity, however it is always recommended to use the carts of required capacity. Our store offers carts that accommodate all kinds of displays. Q. Where can I use the Balt iTeach flat panel mobile cart? A. The Balt iTeach flat panel mobile cart is ideal for every kind of industry such as business environments for presentations and seminars and class room environments for lectures and collaborative discussions. Q. How can I clean the Balt iTeach flat panel mobile cart? A. In order to clean the Balt iTeach flat panel mobile cart, use the wet and soft sponge and lightly rub over loose dirt.